Wine Cellar recently purchased an exciting collection of vintage wines from George Spies’ grandson, Piet Fischer. The collection contained a number of GS Cabernets which were purposely kept for long-term cellaring and passed down through the generations. With such a prized collection for sale, I thought it would be worth summarising and expanding on what we know about the George Spies 1966 and 1968 Cabernets. A good deal of this information is quoted from Joanne Gibson’s award-winning piece, ‘The mystery of South Africa’s greatest red’, written for then WINE magazine in April 2008. ‘It seems Spies didn’t have any tertiary training, but started his winemaking career in the lab at Bellville Winery,’ writes Gibson. This path led Spies to Monis, during an era of mainly sweet, white and fortified wine production, with very few serious reds. Monis and Stellenbosch Farmers Winery (SFW) merged in 1966 and Spies produced a small batch of red wine as a special experimental project. While the large company may not have supported it, and finally cancelled the project altogether, Spies somehow manged to produce 2 impressive vintages of GS. Spies died in 1997 and his daughter Ronel has been unable to provide much more information. With nothing other than the wine and vintage printed on the label, the lack of information opens the story up to much controversy. Bayly is ‘quite certain’ that the wine came from the ward of Durbanville: ‘Monis used to buy red wine from Phil Walker at a farm called Morgenster,’she told Gibson. Morgenster was sold off and developed shortly thereafter, but others suggest that the grapes could in fact have been from Altydgedacht, their neighbour. Neil Ellis was an acquaintance of George Spies and confirmed this when I quizzed him on this in mid-2015. Ellis told me that the wine was made like a white wine, with a short time on the skins before heavy filtering and immediate bottling. If it was made so radically, what was Spies’ motivation and reference? And was it the reductive winemaking along with early bottling that preserved the tannins so graciously? As far as the grape variety goes, Fridjhon writes: ‘It is probable that the Lanzerac, Zonnebloem, and Nederburg wines from the 1960s were a long way from pure Cabernet.’ There are rumours that Cinsaut was blended into the wine. The palate, however, is still remarkably fresh and tannic, different to Cinsaut’s delicate nuances and rounder mouthfeel. Why would Spies note ‘100%’ in very small text on the lower edge of the label if it wasn’t 100% Cabernet? If 4,000 or 5,000 bottles of each vintage were produced (which was the likely size of 1 large barrel, or stukvat), the majority would have been consumed early while the wine was incredibly tannic. Little wine was left during the ’80s and ‘90s when it was ‘mature’ and almost none is around today. South Africa’s warm climate and undeveloped fine wine market did not assist its preservation. It is rare to find cellars from the ‘80s and earlier that are in good condition. I have heard of a number of GS-drinking experiences where poor cellaring has partially or fully ‘baked’ the wine. While the GS is seemingly one of the hardiest wines South Africa has ever produced, finding a good bottle, or cellar, is becoming increasingly rare. Over the years, Wine Cellar has been offered a handful of GS bottles that have been ‘kept in the cupboard’. These should not be on the market. 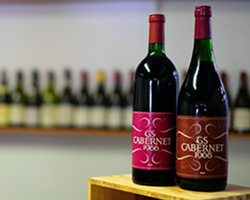 Unlike the fine wines of France, there are few experts to attest to the condition of vintage SA wines, especially the few bottles of the GS ‘66 and ‘68 that are available. This leaves room for fakes as the market realises their rarity and the high prices they command. It is paramount that GS be purchased from a reputable source, with offers on the Nederburg Auction and now the Fischer cellar topping the list. It was later poured blind and enjoyed with some friends over dinner. The bottle was spectacular, vibrant and delicious. A prestigious guest on the evening was Dirk Niepoort and he was also truly impressed (and so were the other tasters until Dirk opened an 1850 port!). I posted the note on a little-read wine website I had called ‘Wineguru’, and it was later picked up on by Jancis Robinson. David Finlayson has always had a strong connection to the wine; apparently his father was a friend of Spies and owned a good collection. His top Cabernet Sauvignon bears the name ‘GS’. It was even more impressive on the palate, with notes of currant and fig paste, smoke, chestnut, incense, date and brandy-soaked plums. It was fleshy, ripe and powerful, with a great core of sweet fruit. Though slightly grainy in texture, the wine was plenty viscous, with a roasted, overripe character that remained fresh and long on the finish nonetheless. This was the real kickstart that the GS needed. Joanne Gibson then produced the brilliant article ‘The mystery of South Africa’s greatest red’ in April 2008. It won the 2009 SA wine writing award and was re-published on Jancis Robinson’s website. It cleared up a number of controversies, but also hit a few dead-ends on the important details. News slowly spread and with the increased interest in new-wave South African wines, suddenly there was interest in vintage SA wines too. Wine Cellar managed to buy and sell a handful of excellent GS bottles and the price gradually increased. After a 7-year absence, Jancis Robinson’s trip to South Africa in early 2015 was important for the industry. Together with WOSA, I dined with Jancis and husband Nick Lander at the Test Kitchen, and I took along a bottle of the ‘66. Why not? In an instance, GS became the first South African wine to receive a perfect score from not only a top international critic, but arguably the most revered wine critic in the world. I needed to taste the GS ‘66 one more time, but up against some serious opposition. Château Latour usually holds the highest percentage of Cabernet amongst the First Growths, and in 1966 it was one of the wines of the vintage. In partnership with the Nederburg Auction, we created the Grand Taste-Off in 2015 to pip some of SA’s top vintage wines against world benchmarks. Then, an incredible line-up of rare wines at the 2015 Nederburg Charity Auction was spearheaded by 2 bottles of tabernacle-stored GS 1966, Distell’s offering at the auction from their historic cellar. They were auctioned at a record price for a 750ml South African red wine. The Bordeaux bottle shows a dark red label (on the verge of pink) with large initials, the vintage and a small ‘100%’ at the bottom in small text. It was clearly hand-labelled as each label is at a different height. Capsules range from dark maroon to a faded purple. The wine? Apparently the wine produced in 1967 was not good enough to be bottled. But purchased from the Fischer cellar was a small bottle of Monisberg with a handwritten ‘1967’ on the label. Could this be a ‘declassified GS’? Has anyone ever seen this bottle? This is very different to the ’66 in that every label I have seen has faded to a maroon, almost-brown colour. The capsules are, however, consistently red. The 1968 is a Burgundy bottle and the labels are all straight, as if they were machine labelled. Most of the bottles seem tattier when compared to the embryonic-looking 1966s. Perhaps the ‘66 has always been more prized and was therefore stored better? The experiment by George Spies at Monis can be likened to what Max Schubert did at Penfolds in creating Grange in 1951. What if SFW Monis had released GS commercially, or allowed Spies to continue the project? Would GS Cabernet have shaped the SA wine industry much like Grange did? Perhaps more information and well-stored bottles will surface. If you know more about this mysterious wine, please get in contact with Wine Cellar.